Let's face it. A good resume template is not going to get you a job. Instead, your achievements on your resume will. Recruiters are substance over style kind of people. What they really care about are your bullet points. Each line must be concise, show you have the right experience, and demonstrate your impact. There are hundreds of resume builders out there. None of them are focused on helping you write effective resume content that will land you an interview. That's where our bullet point builder comes in. Struggling to write your resume? Don't worry. We have hundreds of sample bullet points from top resumes across all industries and skills. Use our templates and sample lines to quickly write an effective resume from scratch. 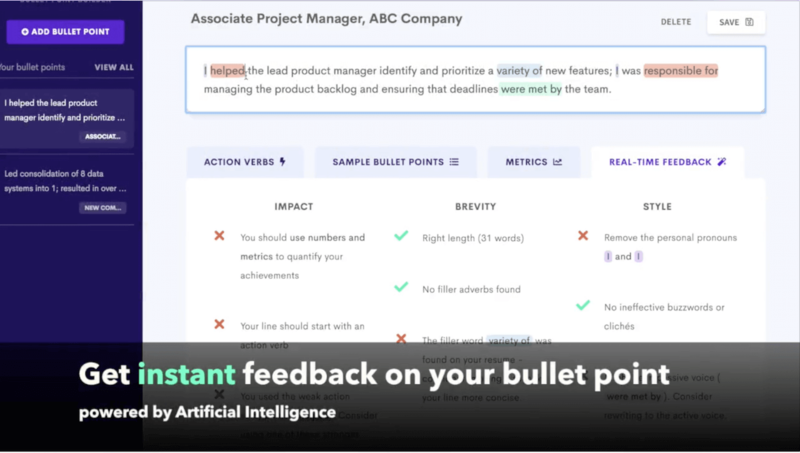 Our AI-powered platform analyzes your bullet point's content based on key criteria recruiters and hiring managers look for, such as Impact, Brevity and Style. You'll get actionable steps to improve your resume's impact, in real-time. 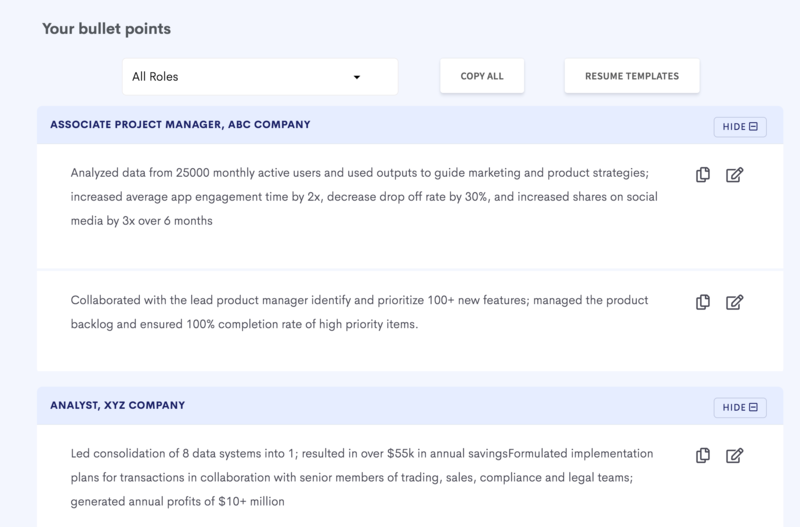 With our bullet point builder, you can create a master list of all your bullet points, experiences and accomplishments for every role you have. This makes it easy to tailor your resume when you're applying for a specific role, since you can just filter out lines and experiences for specific roles, to create a version for a specific job application. You can also easily copy all your bullet points when your ready and use them in any template you want to.